Serrano ham is a highly valued food for its flavor and aroma, known internationally as a delicacy and a key component of the Mediterranean diet. But as well as its status as a gourmet food, not everyone knows about the nutritional qualities of Serrano ham. These are varied and can make an invaluable contribution to health, so we should find out more about what Serrano ham can add to your diet! As interest in traditional diets has increased in recent years, studies into Serrano ham have revealed some interesting facts. The investigation of the nutritional properties of Serrano ham reveal that while ham is a great source of lipids, vitamins and proteins, it's also a great way to get several essential minerals. Containing iron, magnesium, zinc, phosphorus and calcium, Serrano ham is aso rich in Vitamin B1, B2, B3, B6 and trace amounts of Vitamin D, as well as others. Vitamin B1 is especially useful in combating depression and stress, when eating more of this mineral can positively affect the brain'chemistry and make coping easier. On the other hand, Serrano ham is a food that shares many properties with olive oil, because of the similar nature of their lipids. Almost half the fat in a Serrano ham is unsaturated and the main fatty acid found in Serrano ham is oleic acid. In fact, only two foods are a better source of oleic acid: Iberico ham and olive oil. Because of this high oleic acid content, eating Serrano ham can help reduce LDL(Low Density Lipid - "bad" cholesterol) content in the bloodstream, and experts believe it can raise the levels of HDL - the "good" cholesterol. Also, the intake of Vitamin B2 can have positive effects on plasma cholesterol numbers. Another feature of the nutritional properties of Serrano ham is that it allows high levels of protein assimilation compared to other foods. It's a food that's far more easily digested, because of the lower levels of collagen and because of a chemical reaction that takes place during curing. This reaction breaks down proteins into their constituent amino acids, making them more easily digestible and bioavailable. Because of this feature, Serrano ham is a beneficial food for patients recovering from surgery, and for people with digestive difficulties, as well as being a highly valued food in the diet of breastfeeding women and as an aid to the growth of children and adolescents. 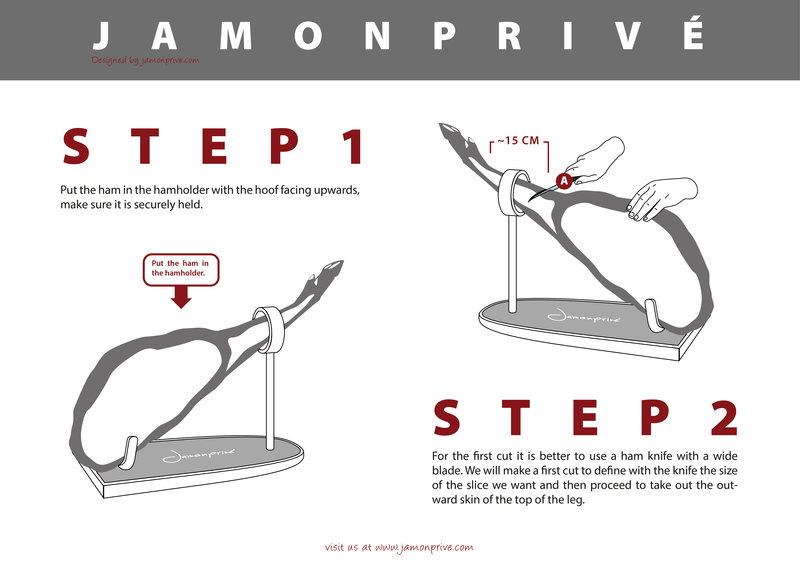 Furthermore, eating Serrano ham can help reduce the chances of osteoporosis, because of its high iron content. Nutritional experts recommend eating foods that contain both plenty of iron and plenty of calcium, since uptake of these peaks at different stages of life and both are essential to bone growth. Another feature of Serrano ham is its high zinc content, which contributes to the intellectual and motor development of infants. Because of these effects, Serrano ham is a good addition to the diet of a pregnant or breastfeeding mother. However, it's important to note that even though Serrano ham has far less sodium than many other Spanish hams it is still a high-sodium food, so people who are already eating too much sodium or who are disposed to suffer hypertension should monitor their intake. 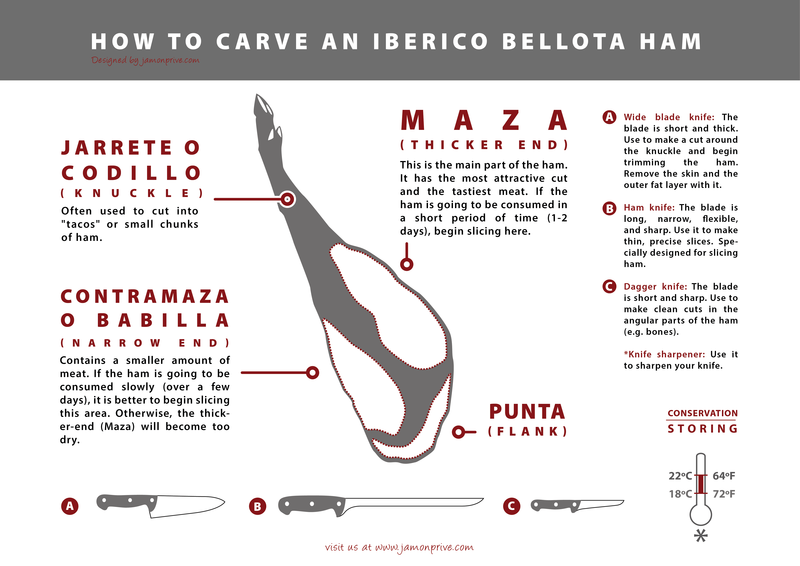 The table below lays out the nutritional information for typical Serrano ham. Knowing the nutritional properties of Serrano ham allows us to appreciate the dietary benefits of this traditional food and to see how taking to the Iberian diet can help our health. Eating Serrano ham regularly, but never in excess, will allow you to both fully enjoy this delicacy and reap the nutritional benefits.